Background: Laparoscopy though minimally invasive produces significant hemodynamic surge and neuroendocrine stress response. Though general anesthesia (GA) is the conventional technique, now-a-days, regional anesthesia has been accepted for laparoscopic diagnostic procedures, and its use is also being extended to laparoscopic surgeries. Objective: The aim was to compare the hemodynamic surge and neuroendocrine stress response during laparoscopic cholecystectomy (LC) under GA and spinal anesthesia (SA) in American Society of Anesthesiologists (ASA) PS 1 patients. Materials and Methods: Thirty ASA physical status I patients, aged 18-65 years were randomly allocated into two equal groups of 15 each. Group A received GA with controlled ventilation. Patients were preoxygenated for 5 min with 100/5 oxygen, premedicated with midazolam 0.03 mg/kg intravenous (i.v), fentanyl 2 mcg/kg i.v; induction was done with thiopentone 3-5 mg/kg i.v; intubation was achieved after muscle relaxation with 0.5 mg/kg atracurium besylate i.v. Anesthesia was maintained with 1-2% sevoflurane and N2O:O2 (60:40) and intermittent i.v injection of atracurium besylate. Group B SA with 0.5% hyperbaric bupivacaine and 25 μg fentanyl along with local anesthetic instillation in the subdiaphragmatic space. Mean arterial pressure, heart rate (HR), oxygen saturation, end tidal carbon-dioxide were recorded. Venous blood was collected for cortisol assay before induction and 30 min after pneumoperitoneum. All data were collected in Microsoft excel sheet and statistically analyzed using SPSS software version 16 (SPSS Inc., Chicago, IL, USA). All numerical data were analyzed using Student's t-test and paired t-test. Any value <0.05 was taken as significant. Results: Mean arterial pressure and mean HR and postpneumoperitoneum cortisol level were lower in group B than group A though the difference was not statistically significant in hemodynamic parameters but significant in case of cortisol. Conclusion: Spinal anesthesia administered for LC maintained comparable hemodynamics compared to GA and did not produce any ventilatory depression. It also produced less neuroendocrine stress response as seen by reduction in the level of serum cortisol in ASA PS 1 patients put for LC. Neuroendocrine stress response is a major event during laparoscopy as tissue manipulation and pneumoperitoneum result in intense stimulation to the nervous system leading to corticosteroid and catecholamine release. This results in hemodynamic surge in the form of raised systemic vascular resistance and hypertension and tachycardia in majority of the cases and raised serum cortisol level. This study was undertaken to compare the effect of GA and SA on the various hemodynamic parameters (heart rate [HR], mean arterial pressure [MAP]), serum cortisol level and any ventilatory impairment (oxygen saturation [SpO 2 ] and end-tidal carbon-dioxide [EtCO 2 ]) during LC in American Society of Anesthesiologists (ASA) PS 1 patients. After obtaining institutional ethics committee clearance and written informed consent from patients, 30 patients of ASA physical status I, aged 18-65 years, body weight 50-70 kg scheduled for LC were included in this clinical trial. Any patient with a history of allergy or spinal surgery or any other systemic disease or on any medications known to affect sympathetic response and cortisol secretions were excluded from the study. The patients were randomly allocated into two equal groups of 15 each - Group A-received GA and Group B - Received SA. Randomization was done following a computer-generated randomization table. Blinding could not be done for both the patient and observer for the obvious difference in procedure. Patients in group A were administered 3-5 mg/kg thiopentone sodium, 0.03 mg/kg midazolam, 2 μg/kg fentanyl intravenous (i.v). They were maintained with sevoflurane (2%) after endotracheal intubation with atracurium besylate (0.5 mg/kg), which was repeated intermittently. In group B, SA was administered at L 2-3 level in sitting the posture with 0.5% hyperbaric bupivacaine and 25 μg fentanyl using 26 gauge spinal needle. Then 15° Trendelenburg position was maintained for 10 min and sensory level was checked at intervals of 30 s till it reached T 4 level or till 10 min, whichever was earlier. In patients in whom adequate sensory level was not achieved, GA was administered and were excluded from the study. In both the groups, lactated ringer solution was infused at 10 ml/kg for 30 min before administration of anesthesia and then maintained at 4 ml/kg/h intraoperatively. In both groups, 8 mg ondansetron and 8 mg dexamethasone were administered i.v and 10 ml of 1% lignocaine was instilled in the right subdiaphragmatic space after pneumoperitoneum. In group B, if patients complained of shoulder pain further, they were treated with fentanyl 2 mcg/kg i.v and midazolam 0.03 mg/kg i.v. For cortisol assay, venous blood was collected from the arm opposite to that in which i.v fluid was infused, before administering anesthesia and 30 min after pneumoperitoneum. Blood was collected in plain red topped venipuncture tubes without any anticoagulant and was allowed to clot. The samples were centrifuged to separate plasma and were refrigerated at 2-8°C for a maximum period of 5 days. The assay was done with microplate enzyme immunoassay (AccuBind ELISA Microwells, Code: 3625-300). The study was done for a period of 5 days as the serum samples could be stored at desired temperature only for 3-5 days. Patients were monitored intraoperatively using multi-channel monitors (HR, noninvasive blood pressure, SpO 2 , EtCO 2 , electrocardiogram). HR and MAP were recorded at 10 min interval. Any desaturation SpO 2 <95%) or hypercapnia (EtCO 2 >45 mm Hg) was recorded. Power calculation based on cortisol level difference of previous study with statistical power of 90% and α < 0.05 minimum sample size was calculated to be 30. All the data were noted in Microsoft excel sheet (version 2002) and statistical analysis was done using SPSS software, version 16.0 (SPSS Inc., Chicago, IL, USA) for Windows. Numerical data were analyzed with the help of Student's t-test and categorical data were analyzed using Chi-square test. P < 0.05 was considered as significant. In each group 15 patients were taken. The two groups were comparable regarding demography and baseline hemodynamics [Table 1]. 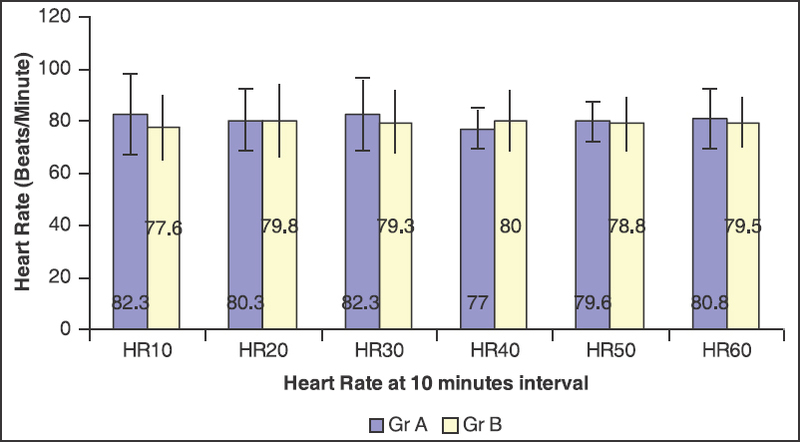 In each group, HR is seen to have reduced from baseline but inter-group comparison shows that reduction in HR was more in group B as compared to group A, though the difference was not significant [Figure 1]. 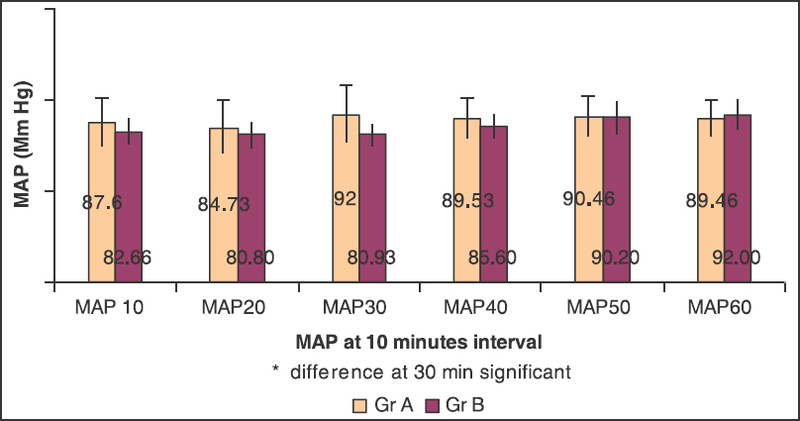 In the case of MAP, it was always more in group A than in group B though the difference was only significant at 30 min (P = 0.01) [Figure 2]. Cortisol level as measured 30 min after pneumoperitoneum was found to rise in group A from the preoperative value, though the difference was not statistically significant. In group B, cortisol level reduced significantly 30 min after pneumoperitoneum (P = 0.004). The preoperative values of cortisol were comparable in both the groups, but the postpneumoperitoneum cortisol levels were significantly less in group B (P = 0.004) [Figure 3]. For LC to be completed successfully, anesthetic level up to T 4 -T 6 was required which was achieved with a dose of hyperbaric bupivacaine (3.5 ml) with opioid adjuvant at L 3 -L 4 level intrathecally. , We also achieved similar anesthetic level with a similar dose of drugs in this study. One of the limitations with using SA for LC encountered was severe irritation to the parietal peritoneum resulting in shoulder pain due to CO 2 insufflation. In this study, we have treated such pain with judicious use of i.v fentanyl and instillation of lignocaine 1% under the undersurface of diaphragm on the right side as soon as possible after pneumoperitoneum was created and by using low CO 2 insufflation rate to maintain intra-abdominal pressure (IAP) <12 mm Hg. As carbonic acid produced after CO 2 insufflation produces referred pain in shoulder after contact with under the surface of diaphragm, instillation of local anesthetic prevented this pain. Laparoscopic surgeries have shown various hemodynamic changes, e.g., increased MAP (29%) and increased cardiac index (22%). , The increase in systemic vascular resistance during laparoscopic surgeries has multiple origins e.g., - a reflex sympathetic response to the pneumoperitoneum induced decline in cardiac output, release of various neurohumoral factors due to peritoneal stretching and influence on posture. The spinal sympathetic block compensates for the increased sympathetic tone resulting from pneumoperitoneum in head-up position and offsets the vasomotor constriction of splanchnic organs and leg muscles. This explains why none of the patients experienced intraoperative hypertension. Vasodilatation due to SA induced sympathetic blockade, and avoidance of positive pressure ventilation lessens the hemodynamic perturbations due to pneumoperitoneum. In this study, MAP was found to be always lower in SA group than in GA group. Usual finding of hypotension was not found in this study, which may be attributed to liberal fluid therapy, low IAP, minimal operating table tilt and absence of any cardiovascular disease in the patients. HR was also found to be lower in the SA group in this study, though not significant statistically. None of the patients in either group showed any incidence of desaturation (SpO 2 <95%) or hypercapnia (EtCO 2 >45 mm Hg). Among neuroendocrine hormones, cortisol and catecholamines have been shown to rise following pneumoperitoneum even with other different anesthetic techniques (GA, GA + epidural). In a study Calvo Soto et al. have shown that SA alone has prevented the rise in cortisol level, but epidural anesthesia could not do so. In this study, patients who received SA revealed less cortisol level after pneumoperitoneum that was statistically significant, compared with the patients who received GA (P = 0.004). When the pre and postpneumoperitoneum cortisol levels were compared in the SA group alone, there was a significant fall after pneumoperitoneum (P = 0.004). With GA, cortisol level was seen to rise after pneumoperitoneum, though not statistically significant. Limitations of the current study are - inadequate number of patients (based on the result of previous study, we calculated the sample size of at least 24 in each group with a power of 0.9 and type one error of 0.05) not measuring other markers of stress response, no objective measurement to exclude any microaspirations. Since the serum samples could be stored at desired temperature only for 3-5 days, we could get only such number of patients. This inference would be better validated if performed in a muticenter trial with more number of patients including those with other comorbidities e.g., hypertension, diabetes etc., and if other markers of stress response as adrenocorticotropic hormone, catecholamines could be measured. More objective scoring system for patient satisfaction such as a numeric rating scale can be used to quantify satisfaction as was done by Naguib and Samarkandi  can be used to enhance the quality of the study. Spinal anesthesia with hyperbaric bupivacaine (3.5 ml) and fentanyl (25 mcg) provides adequate anesthesia for LC with CO 2 pneumoperitoneum when compared to GA in ASA PS 1 patients put for LC. There was even no incidence of hypercapnia and desaturation with SA. Prof. Manjusree Ray, Principal, Burdwan Medical College. Prof. Keya Pal, Head of the Department, Biochemistry, Burdwan Medical College. Prof. Amit Banerjee, Head of the Department, Anesthesiology, Burdwan Medical College. Pursnani KG, Bazza Y, Calleja M, Mughal MM. Laparoscopic cholecystectomy under epidural anesthesia in patients with chronic respiratory disease. Surg Endosc 1998;12:1082-4. Gramatica L Jr, Brasesco OE, Mercado Luna A, Martinessi V, Panebianco G, Labaque F, et al. Laparoscopic cholecystectomy performed under regional anesthesia in patients with chronic obstructive pulmonary disease. Surg Endosc 2002;16:472-5. Motamed C, Bouaziz H, Franco D, Benhamou D. Analgesic effect of low-dose intrathecal morphine and bupivacaine in laparoscopic cholecystectomy. Anesthesia 2000;55:118-24. Hamad MA, El-Khattary OA. Laparoscopic cholecystectomy under spinal anesthesia with nitrous oxide pneumoperitoneum: A feasibility study. Surg Endosc 2003;17:1426-8.
van Zundert AA, Stultiens G, Jakimowicz JJ, Peek D, van der Ham WG, Korsten HH, et al. Laparoscopic cholecystectomy under segmental thoracic spinal anesthesia: A feasibility study. Br J Anaesth 2007;98:682-6. Bessa SS, Katri KM, Abdel-Salam WN, El-Kayal el-SA, Tawfik TA. Spinal versus general anesthesia for day-case laparoscopic cholecystectomy: A prospective randomized study. J Laparoendosc Adv Surg Tech A 2012;22:550-5. Lennox PH, Chilvers C, Vaghadia H. Selective spinal anesthesia versus desflurane anesthesia in short duration outpatient gynecological laparoscopy: A pharmacoeconomic comparison. Anesth Analg 2002;94:565-8. Yuksek YN, Akat AZ, Gozalan U, Daglar G, Pala Y, Canturk M, et al. Laparoscopic cholecystectomy under spinal anesthesia. Am J Surg 2008;195:533-6. Aono H, Takeda A, Tarver SD, Goto H. Stress responses in three different anesthetic techniques for carbon dioxide laparoscopic cholecystectomy. J Clin Anesth 1998;10:546-50. Rodgers A, Walker N, Schug S, McKee A, Kehlet H, van Zundert A, et al. Reduction of postoperative mortality and morbidity with epidural or spinal anesthesia: Results from overview of randomised trials. BMJ 2000;321:1493. 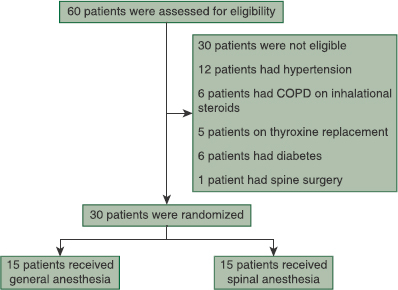 Tzovaras G, Fafoulakis F, Pratsas K, Georgopoulou S, Stamatiou G, Hatzitheofilou C. Spinal vs general anesthesia for laparoscopic cholecystectomy: Interim analysis of a controlled randomized trial. Arch Surg 2008;143:497-501. Sinha R, Gurwara AK, Gupta SC. Laparoscopic surgery using spinal anesthesia. JSLS 2008;12:133-8. Lee JH, Huh J, Kim DK, Gil JR, Min SW, Han SS. Laparoscopic cholecystectomy under epidural anesthesia: A clinical feasibility study. Korean J Anesthesiol 2010;59:383-8. Ali Y, Elmasry MN, Negmi H, Al Ouffi H, Fahad B, Rahman SA. The feasibility of spinal anesthesia with sedation for laparoscopic general abdominal procedures in moderate risk patients. Middle East J Anaesthesiol 2008;19:1027-39. Gautam B. Spinal anesthesia for laparoscopic cholecystectomy: A feasibility and safety study. Kathmandu Univ Med J (KUMJ). 2009;7:360-8. Critchley LA, Critchley JA, Gin T. Haemodynamic changes in patients undergoing laparoscopic cholecystectomy: Measurement by transthoracic electrical bioimpedance. Br J Anaesth 1993;70:681-3. Calvo Soto P, Martinez Contreras A, Hernandez BT, Peraza Garay FJ, Vasquez C. Spinal-general anesthesia reduces neuro endocrine stress in laparoscopic cholecystectomy. J Int Med Res 2012;40:657-65.